In a country where traffic congestion is a perennial problem, a cycling app that aims to connect biking enthusiasts and provide bicycle-friendly neighborhoods caught the designing community’s fancy. Developed by Trisha Tobias, We are Here was chosen the winner of the Mobile App Design for Social Good category and recipient of the Lucille Tenazas Design Excellence Award at the recent adobo Design Awards. Connecting friends and other bikers in the neighborhood who share the same route to places like office and school, the app establishes a common spot to meet up and creates a route to an area near their destinations, providing opportunity for people to establish bike groups or for people to simply undertake a lifestyle change together. Globe supported Mobile App Design for Social Good category to recognize entries in the mobile application format that presents creative solutions to social issues. “Design is not just about making an artifact but it’s also about creating a strategy. It’s also about creating an impact. I think the idea of using bicycles as a mode of transportation is something that is being underused in our country. I think from the standpoint of design, this design solution enhances civic behavior. The designer in this case was able to present a solution that will impact society. It goes back to what I’ve always thought; design is not just about making things. It’s about making things happen.” said Lucille Tenazas, founder and principal of Tenazas Design, as she explained her choice for the award. For her part, Globe Senior Vice President for Corporate Communications Yoly Crisanto stressed “the app fits the bill for a technological innovation that drives positive societal change. We hope this will further inspire development of technological concepts that will benefit our society as we all strive in creating a wonderful Philippines,” Crisanto said. In her entry, Tobias emphasized that cycling is a good solution to reduce carbon footprint and cut back on costs. However, there is lack of awareness of bike rules and etiquette, which often leads to accidents and even death. Instead of seeing a road to progress, people see risks, so they choose not to bike. She said studies have shown that vehicular drivers are more cautious when there are more bikers and pedestrians in the vicinity. There is safety in numbers and encouraging people to bike together is the first step to changing mindsets. Aside from connecting bikers living or working in the same community, the app also features weather forecast in a given location to provide bikers an insight on whether the day is optimal for riding as well as upcoming events where bikers will be able to respond to invitations from friends, or browse for a community bike rides in their area. Facebook page for the movement also aims to inform people of bike rules. 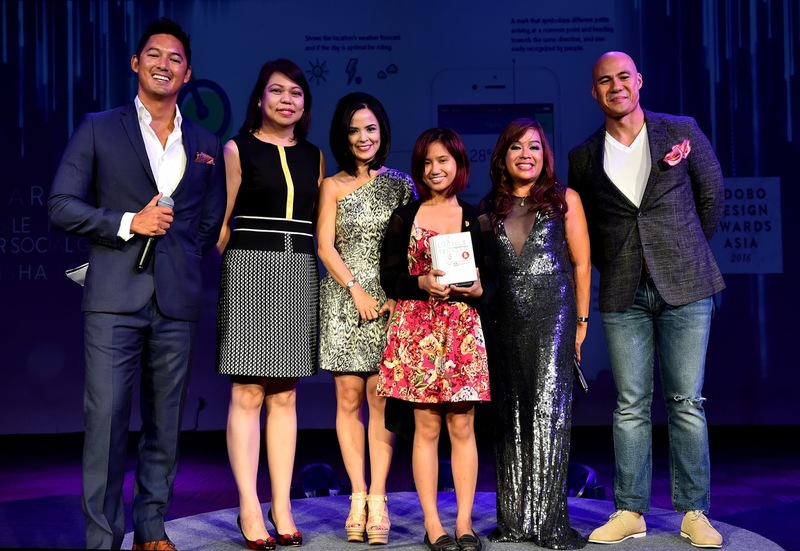 Photo caption: Globe Senior Vice President for Corporate Communications Yoly Crisanto (2nd from left) presents the Mobile App Design for Social Good category at the recent adobo Design Awards to Trisha Tobias (3rd from right), developer of We are here, a cycling app that gives cycling and biking communities the means to connect while driving positive societal change. Crisanto is joined by Angel Guerrero (2nd from right), President and Editor-in-Chief of adobo; Janelle Squires (3rd from left) adobo Vice President and Chief Operating Officer; and event hosts Rovilson Fernandez and Marc Nelson.